Nature has a mathematical and algorithmic bottom. Or, better, math and algorithms provide a key to describe and reproduce natural processes of morphogenesis. Mathematic is a linking principle that weaves together artists, physicians and mathematicians of course. More to that extent, beauty also has a mathematic bottom: throughout history many great artists realized that math was the key to unlock higher levels of complexity in their expression and technique, from ancient Greeks to our present day, rigorous exploration coupled with a personal universe of sensibilities. It seems that we are witnessing an interest for math in bridging disciplines belonging in origin to science and/or art: such intensity has a precedent only in the Baroque, when tremendous progresses of science and philosophy triggered a fruitful exploration of complexity and continuity both in space and expression: the use of complex curves, ellipses, platonic solids and derived rules. Looking at the ceiling of Borromini’s S. Carlo alle Quattro Fontane in Rome what we see is parametric tessellation in action, self-similar components forming a continuous surface. The same process was explored several centuries later also by M.C. Escher, challenging Borromini’s spatial complexity on a pure perceptive level, still with the same underlying strong basis in mathematic principles that drive geometry. Designing panels is something that deals with the issue of tessellation, the discretization of the continue through components. 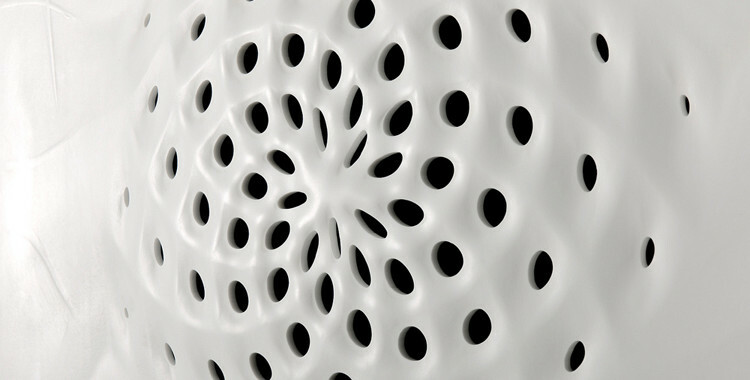 These panels are an exploration of mathematical algorithms applied, through parametric design in Rhinoscript and Grasshopper, to a new 3-dimensional production technique for DuPont Corian®. Even though each panel gravitates around one dominating principle, they surely embed more than one: each of them is a narration of a particular generative process, but reversing the direction that goes from a process to its generated form, it is true that forms can be descriptive of many processes. For example the Penrose tiling, the Fibonacci sequence and the golden ratio are intricately related and they should be considered as different aspects of the same phenomenon. One of the more interesting aspects in our design exploration is the application of algorithms through parametric strategies to generate modulations, oscillations between stable states, (rather than an unvaried repetition) and balance them with issues of seamless tiling within a square-angled framed component, material logic and production techniques.
. Corian® 3D Math Serie is made of 6 different panels, each inspired from a mathematic principle or the mathematician who gave his name to the principle. Those panels are shown here in alphabetical order: Fibonacci, Fourier, Gauss, Moiré, Phyllotaxis, Voronoi.
. Corian® 3D Math Serie official website. I like the helpful information you provide to your articles. I will bookmark your weblog and take a look at again here frequently. I am moderately sure I’ll learn lots of new stuff proper right here! Best of luck for the following! Magnificent site. Lots of useful info here. I’m sending it to several friends ans also sharing in delicious. And naturally, thanks to your sweat!